The first lesson taught in business school is the value of diversification. Most students could have saved themselves a lot of money by listening to their parents who advised them against “putting all their eggs in one basket.” While that advice has certainly proven to be wise in the long-term, on a short-term basis this is not always the case, as evidenced by the year-to-date returns of various asset classes listed below. Notwithstanding the recent pullback, the U.S. stock market has been the top performer on a year-to-date basis among all asset classes used in our portfolios. For investors who have not created diversified portfolios and have a majority of their exposure to the U.S. stock market, they have been nicely rewarded (so far) on a year-to-date basis, with returns exceeding 15%. It is during these times when individuals (and even some clients) contemplate eliminating or reducing their exposure to the other asset classes such as bonds and think about going “all in” with a 100% allocation to equities. This is when investors would be wise to heed the strategy of “buying low and selling high.” Selling bonds that have modestly declined, to purchase stocks that have dramatically advanced, runs counter to the buy low, sell high strategy, and this is when a disciplined investment approach is needed to possibly prevent unnecessary declines in the future. When there are “buy one get one free” sales on your favorite beverage, you typically load up your shopping cart. Investors are often irrational and this is quantified by the Dalbar Quantitative Analysis of Investor Behavior study in which the results consistently show that the average investor earns less – in many cases, much less – than actual mutual funds in which they are invested. This shows that investors often buy high and sell low, which is counter to wealth creation. For my CFP® students at Barry University, I typically use Publix grocery store as an example. When there are “buy one get one free” sales on your favorite beverage, you typically load up your shopping cart. However, when the financial markets are inexpensive, and go “on sale”, investors typically sell their holdings. Does this make financial or rational sense? No! 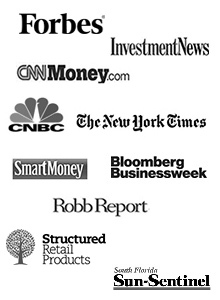 We are acutely aware that it’s not easy to remain disciplined when the financial news media is shouting “buy” or “sell” and creating a frenzy. It is during those times when we add value to our clients’ portfolios by remaining focused on their long-term financial goals and objectives and assist them in refraining from making emotional decisions. Our job, as your advisor, is to construct a diversified portfolio that contains a variety of asset classes that do not move in tandem with one another. A portfolio that contains investments that only move together is not a well-diversified portfolio. This year is one of those times when investors wish they had 100% exposure to the U.S. stock market to take advantage of the outsized gains. Unfortunately, these individuals have neglected to remind themselves what happened to the market during the tech bubble (2000-2002), the housing bubble (2008-2009) and the debt ceiling debate/downgrade of the U.S. credit rating (Q3 2011), when declines ranged from minus 20% to minus 50%. Failing to diversify a portfolio may result in significant losses for an investor. Since our priority is to work hard and help to prevent your wealth from declining, we diversify your portfolio among a variety of investment vehicles and asset classes. During many years, and over normal market cycles, investors have been rewarded for their patience and diversified approach to investing. However, there are periods when diversification does not appear to be working, and that is when a disciplined approach must be maintained. We believe that 2013 is one of those years. If you have financial questions, we would love to help you. Please call us at 1-800-65-9560. We also offer 60-minute, complimentary consultations to review your investment goals, retirement needs and current investment strategy . 1650 Wealth Management is a Fee-only, Independent, Registered Investment Advisor (RIA) firm located in South Florida with office locations in both Fort Lauderdale and Miami. The Certified Financial Planners (CFP®) at 1650 Wealth Management possess over 40 combined years of investment experience, specializing in working with business owners, entrepreneurs and working professionals. **Performance data is through 8/27/13. **Asset classes in which we utilize structured notes. Why Should I Hire a Financial Advisor?